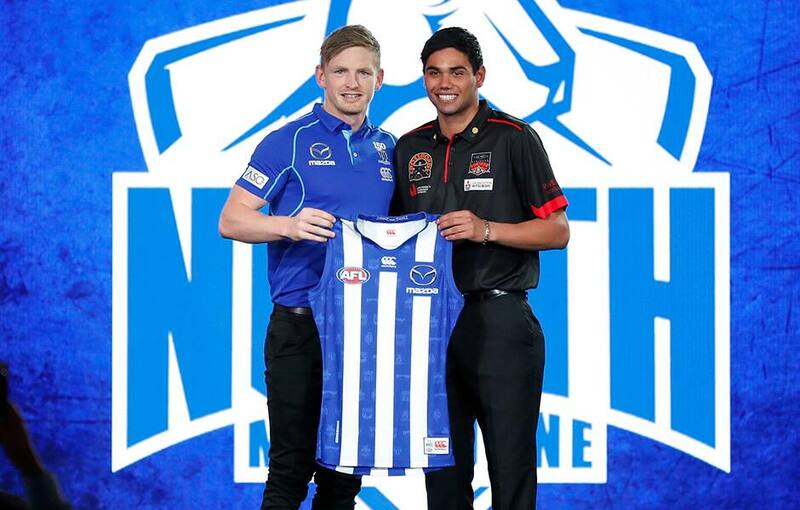 The 2018 NAB AFL Draft has reached its conclusion, and North Melbourne is excited to welcome six new Shinboners to the club, as well as the return of one familiar face via the rookie draft. North Media takes a look back at a busy two days, and the players that will potentially pull on the royal blue and white in 2019. North Melbourne elected to match Adelaide’s bid on the academy prospect, after the Crows looked to take Thomas in the top ten. A member of the Roos’ Next Generation Academy since inception, Thomas has long been involved with North, training with the senior list on multiple occasions, even featuring in the VFL side earlier this year. Having seen what Thomas is capable of first hand, and after he impressed throughout the year, the Roos didn’t hesitate to pounce and move up the order so secure the exciting midfielder. A naturally talented midfielder, Tarryn Thomas has the ability to make an impact down forward and even go and play off half-back. "I can't wait to play in the blue and white." 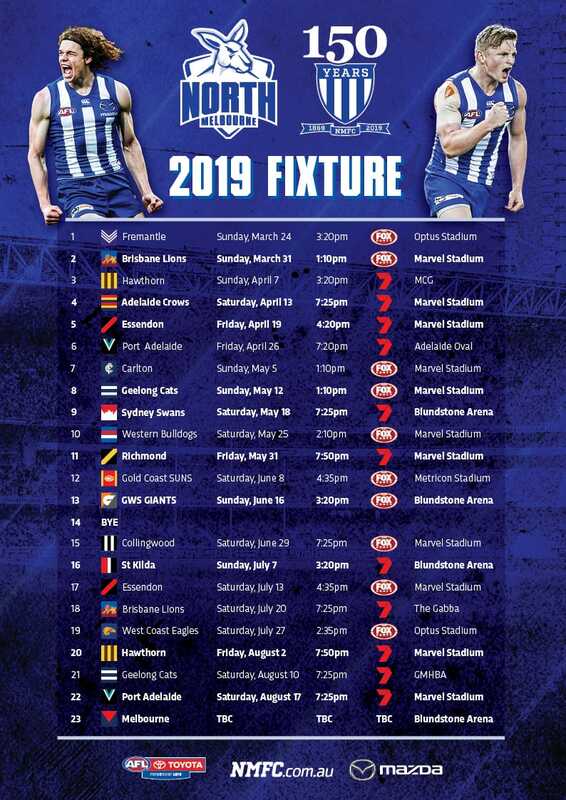 The drafting of Curtis Taylor was the result of some savvy pick-trading from the North Melbourne recruiting team under the new live trading system. Having earlier traded pick 51 to St Kilda for a future third-round selection, the Roos seized their chance to draft Taylor, who had been seen as a potential first-round draftee, by trading the future third-round pick acquired from the Saints for the Bulldogs’ pick 46, and using it to select Taylor. Taylor is a mid-sized forward who can play through midfield, and has no issue with damaging on the scoreboard. Taylor’s strong overhead marking and impressive kicking will give Roos fans plenty of reason to be excited for the future. A medium-sized forward with an eye for goal, Curtis Taylor will undoubtedly add another dimension to our forward line. Bailey Scott became North Melbourne’s first father-son selection since Luke McDonald in 2013, after the Roos elected to match Geelong’s bid at pick 49. Son of premiership winner Robert, Scott is a tough midfielder who has built an elite endurance base. As well as being able to cover plenty of the ground with ease, Scott has impressive skills and should complement the North Melbourne midfield group nicely. An elite endurance runner with impressive skills. We can't wait to see what Bailey Scott is capable of over the coming years. North’s final pick of the National Draft was Joel Crocker, another father-son selection. Son of current Director of Coaching and premiership player Darren, Crocker has had a torrid time with injury in recent years, but showed enough potential as a junior to be taken by the Roos. Crocker is able to play through midfield and as a forward, and has the ability to impact on the scoreboard. Injured for much of the season, there's plenty of development and potential in Joel Crocker. Able to play across half-back or through midfield, McKenzie is blessed with elite pace, recording the fastest 20m sprint time at the 2018 NAB AFL Draft Combine. McKenzie is a strong contributor off half-back with his speed, but is able to pick up plenty of the ball in as an inside midfielder, averaging 23 disposals for the Northern Knights in 2018. As expected, Kyron Hayden was re-selected as a rookie by the club. Having been overlooked in four consecutive drafts, Tom Wilkinson has been given an AFL lifeline by North Melbourne, which selected the forward with pick 41 in the 2018 Rookie Draft. Initially overlooked due to his disposal efficiency, Wilkinson has turned that aspect of his game around this past season, kicking 36 goals from just over 65 per cent accuracy.